Even though I hate getting my hands dirty, I am known as a “crunchy granola” person in the office, which is understandable. My boyfriend works for a biotech business, I recycle and compost religiously, I shop at farmers’ markets, and I try to be conscious of the products I use and recognize their impact on the water table and the broader environment. I see the image I project and I embrace it—it’s cool to care about the planet! What’s funny is that in the context of my boyfriend’s coworkers, I am probably one of least green among them. Almost all of them bike to work (even in -10 degrees F weather) and most raise their own food. One of his coworkers has gone so far as to build his own (small) hydroelectric dam to generate electricity and remove himself from the grid. My efforts are a drop in the bucket compared to theirs. When I first moved to the Capital Region, I cried and told my boyfriend, “I don’t want us to get chickens, like all of the other eco-weirdos.” From living here the past 2 years, and spending time with my boyfriend’s coworkers, my perspective has slowly changed from listening to their perspectives on the local food movement and the satisfaction they get from raising their own food (and controlling what goes into it). So when Gavin came home with the idea to turn his orchid hydroponic system into an aquaponic system so that we could raise fish and produce, I decided that it couldn’t hurt and I might learn something in the process. 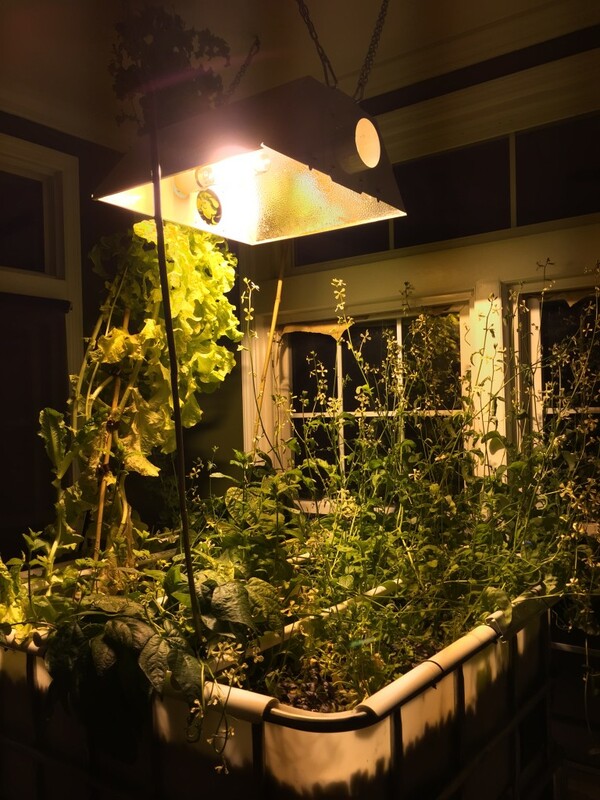 What is an aquaponic system? It is a method of food production that combines aquaculture and hydroponics in a symbiotic environment. In laymen’s terms, we are raising both fish and food in a mostly self-sustained system. 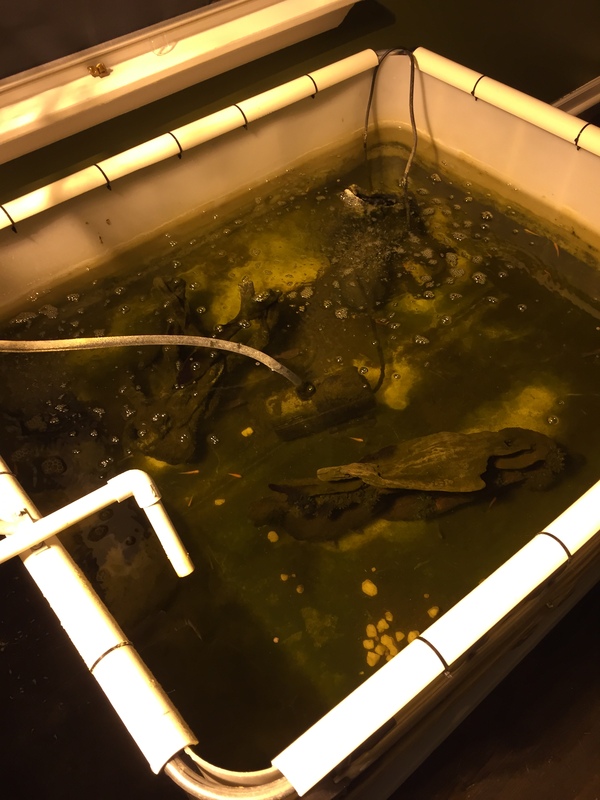 Water circulates the fish tank and the plant tank, transferring the fish excretions to plants, and returning clean water to the fish, keeping them both happy and healthy. Among many other things, we are growing lettuce, lavender, peas, parsley, and arugula alongside 20 or so bass (yep, we intend to eat the bass as well!). The fish and plants have been growing dramatically—we have dinosaur-sized lettuce leaves and peas the length of my hand, which to me proves the efficacy of the system. The entire system is housed in our “green room,” a sunny room on the corner of our house is only a few steps away from the kitchen. It probably invites many odd looks from the neighbors, but it works! This foray into farming has taught me about engineering and farming (albeit on an incredibly small scale), and has given me a new-found appreciation for the food I eat and the work that has gone into it. I guess I am a bit more “crunchy granola” than I thought!